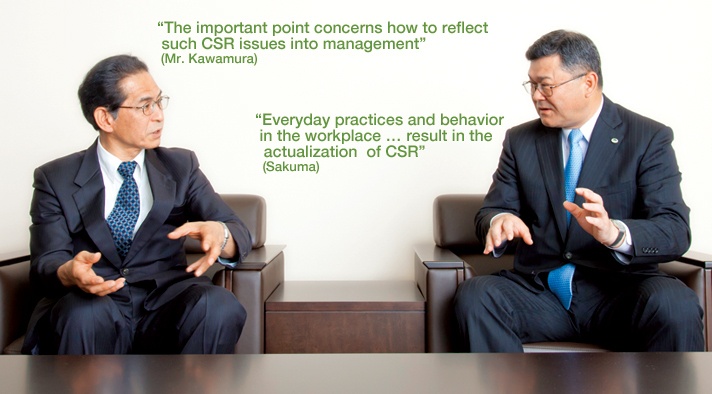 In May 2014, we invited the CSR research expert Mr. Masahiko Kawamura for an interview with our top management. While extracting various important management issues predicated on acceleration of global deployment, the talk covered a diversity of issues aimed at realizing fusion between business and CSR. Three and a half years have passed since the founding of your new company. From your standpoint as president, how do you view CSR in your company? We began as Hitachi Solutions in October 2010, however, prior to that we already had more than 40 years of history in IT solutions development within the Hitachi Group. Since the Hitachi Group has always worked in the social infrastructure business, we have inherited in our DNA the stance of conducting work with awareness of deep links with society. The term CSR sounds extremely well prepared. However, this is something that cannot be achieved overnight. I believe that it is desirable for everyday practices and behavior in the workplace to naturally comply with CSR and result in its actualization. 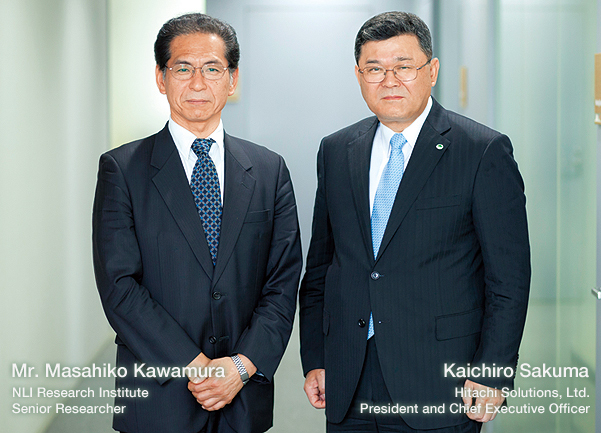 It's certainly true that everybody in the Hitachi Group has the desire to "support society" in their DNA. Particularly in your company's IT field, "people" are the biggest resource, but what points do you stress when conducting human capital development? As you say, people mean everything to this company. In our core business of building systems, people design and develop each system and deliver them to each individual customer. This means that people determine the success or failure of the business. Therefore, it is important to not only enhance the capability of each employee but also to build workplace environments in which people can work with vigor and good feelings. For this reason, we have established a dedicated coordinating department to promote diversity management, and we have established a life career support setup. Our company has a disabled persons' ski club, and the exploits of its members in the Sochi Paralympics inspired and motivated other employees. Also, since almost all of our work is conducted in teams, in addition to improving individuals, it is important for us to unify our direction as an organization so that we can fully exhibit our abilities as a team. For this reason, we strive to build well-aired and open workplaces through staging various events aimed at improving communication in the company. An example of this is "Nominication"*, which is frequently covered by the media. *System for holding meetings followed by subsidized social gatherings in the company with the objective of vitalizing communication across different departments and job positions. When thinking in terms of "globalization and human rights," it is important to advance work based on the clear understanding that a sense of value and cultures are different from one's own. Many of the enterprises that do not succeed overseas fail to modify their domestic successes and values, and then they encounter situations they didn't assume at all. However, in foreign countries, not only do people's values and cultures differ, but the structural issues faced by society are also different. This can be viewed as a risk for Japanese enterprises, but at the same time it contains potential for business opportunities. Our company is also putting effort into globalization. Currently, we conduct business out of 20 offices in 77 countries, and we have more than 1,300 foreign employees. Because software and solutions are business fields closely tied to local cultures, global deployment tended to lag behind, however, we have come this far by implementing M&A, acquiring global human resources from outside of the company, and having Japanese employees tackle globalization. I hear that your International Corporate Volunteering Program* has been introduced as a new initiative for developing global leaders. The International Corporate Volunteering Program is a program for dispatching human resources to emerging countries for a certain period to utilize their job skills in contributing to local communities. We dispatched our first employee under this program to Indonesia in the fall of 2013. He spent two months constructing a lending management system for the library of an NPO working on regional development, education, health issues and so on in the local area. A second employee was dispatched to the same organization in April 2014 to offer support for sales and marketing activities. On both occasions, the recipient NPO rated these activities very highly. That's wonderful. For global leaders, not only do they need to speak English and understand business, but they must also be familiarized with the local people and society and have the ability to localize management. *International Corporate Volunteering Program: A program, operated by the specified non-profit corporation Cross Fields, for dispatching corporate human capitals to NGOs, etc. in emerging countries for a certain period to utilize their core job skills in solving social issues together with the local people. I would now like to turn to the risk aspect of CSR. When we try to transplant Japanese values overseas, risks especially arise in the area of human rights and labor customs. A system is needed for rapidly bringing problems occurring at overseas locations to headquarters, discerning their degree of importance, and reaching immediate decisions. We also consider this to be one of the issues we face in deploying our business overseas. The Hitachi Solutions Group considers it necessary to build the infrastructure for nurturing CSR awareness and systems for sharing information regarding human rights, labor, environment, etc. I'm sure that the Hitachi Group already has a governance mechanism that includes non-financial elements, and I hope that you are making full use of it. I understand that your company is also involved with CSR supply chain management. Our work cannot be sustained by this company's employees alone. We have organized and advanced projects together with the personnel of our group companies and numerous other partner companies. Therefore, we have a pressing need to establish CSR management throughout the entire supply chain including partner companies. From the viewpoint of CSR, proactively responding to overseas controls and market needs based on ISO 26000 constitutes both risk management and also business opportunities to establish superiority in the market. It is most reassuring to hear that you have a full perspective of CSR issues. Because supply chain governance is very difficult, it is best to promote it starting from domestic and then overseas contract suppliers, and then to move onto subcontractors beyond them. This process will absolutely prove beneficial for nurturing the CSR mind of employees. We earlier talked about the fusion of business with CSR, however, the important thing concerns how to reflect such CSR issues into management. I hear that the Hitachi Group has already made a positive start on this. This is an extremely pioneering case among all the numerous companies out there. Although we have only just begun, the Hitachi Group is striving to identify materiality and reflect it in the mid-term management plan based on the policy of linking business management with CSR. In line with this, Hitachi Solutions also aims to promote business and fuse CSR, and we are striving to share and foster society-based thinking concerning the ways in which our products and services can contribute to customers, their users, communities and society. Only the other day, following a suggestion by our sales department, we staged a workshop for all sales departmental managers under headquarters jurisdiction to think about the relationship of CSR in sales activities. We also staged a workshop for our General Managers of key business divisions to examine the materiality we need to tackle. At both these workshops, I hear that many participants pointed to the importance of creating business based on the social viewpoint and incorporating CSR into the business strategy. I intend to immediately instigate verification of the issues that have been raised today and tie them to our materiality settings. Hitachi Group's "Hitachi Smart Transformation Project" is an initiative aimed at innovating our globally competitive business structure and cost structure amidst the evolving shape of international business competition. This is something that we must achieve at all costs. I believe that doing this will help realize the fusion of business promotion with CSR and lead to the creation of new values. Today, thank you for offering many valuable opinions. 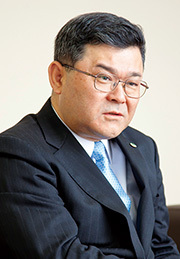 After completing his master's degree at Kyushu University Graduate School of Engineering in 1976, School of Engineering, he joined MODEC, Inc. and worked on offshore oil-related project management in the Middle East and Southeast Asia. In 1988, he joined NLI Research Institute and is involved in study and research work mainly in the areas of environmental management, environmental rating, CSR, environmental business, and integrated reporting. 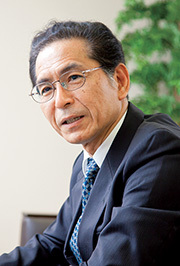 He is Vice President of the Sustainable Management Forum of Japan. His most recent work is "Kiro-ni-tatsu Nihon-no CSR" ("Japanese CSR at the Crossroads").